Are you looking for proper raw dog food? Do you know which ingredients are best for your pet? How to avoid mistakes and still provide the best nutrients? As it turns out, unprocessed dog diet has been a highly debated topic for years. While some pet parents support this type of nutrition, others are adamantly against it. So where the truth lies? What Are Freeze-Dried Raw Dog Food? Why is Raw Diet Better Than Normal Dog Food? We would say somewhere in between! It all depends on your dog and his feeding requirements. In today’s article, we will review the best raw dog food, pointing out benefits and side-effect. Using our comparison, you will have a clear picture, which will help you determine whether mildly-processed dog food works for your canine or not. Stella and Chewy’s variety of raw frozen or freeze-dried recipe will meet the requirements of every pet and his owner. The product is made with care, and the presence of high-quality ingredients makes it a number one choice on our list. It features an unprocessed, single-sourced protein, combined with 100% organic fruits and vegetables. The company proudly points out that recipe is made with 95% cage-free chicken, including bones and organs. This product is formulated to mimic a dog’s natural diet and avoids the use of grains, gluten, and cheap fillers. Overall, the Stella & Chewy’s Freeze-Dried Dinner Patties will offer your canine balanced and complete nutrition, while keeping his health in check. 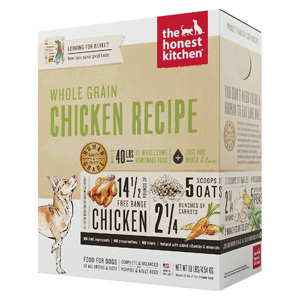 The Honest Kitchen whole grain blend features a particular formula that rich in calories and protein. Whether you have an active canine, a puppy, or a pregnant pooch, this freeze-dried meal will match their needs and promote healthy digestion. In the last couple of years, the recipe has gained a lot of supporters. And, it’s one of the best-sellers in the dehydrated raw dog food range. 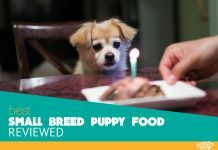 Finally, if you are into budget-friendly dog sustenance, which fulfills nutritional values and stimulates digestion, then the Honest Kitchen should be your next pick. When it comes to raw diet, feeding your canine with natural ingredients will ensure proper development and high absorption of nutrients. The TruDog Feed Me dehydrated recipe contains a real grass-fed Wisconsin beef, and leaves out all harmful ingredients. Extracted from a herring oil, amino acids and omega fatty acids will promote softer coat, fewer allergies, and fresh breath. The freeze-dried process locks in all crucial nutrients, and it doesn’t require refrigeration. To conclude, TruDog is a reasonable food choice if you want to achieve a balanced diet with your pet. The nutritional benefits of unprocessed formulas are undisputable. However, many pet parents feel that raw feeding requires too much time and hassle. That’s why I and Love and You dog food manufacturer sets to unite these two aspects. They offer a convenience of kibble and the nutritional quality of raw diet. The free-range beef serves as a primary protein source. Combined with whole eggs, fruits and vegetables, I and Love and You will offer you canine a complete meal, without skimping on nutrients. To sum up, this grain-free low glycemic meal has a vast nutritious potential, which enhances bodily functions of your pet. The Raw Boost diet from Nature’s Value combines healthy proteins while retaining full flavors of dehydrated ingredients. Your canine will have an opportunity to experience real meats such as chicken, turkey, salmon, and menhaden fish. The delicious flavors will awake your pet’s taste buds, enabling him perfect meal that will satisfy all his needs. We should also mention the presence of the fish. It boosts up the levels of EPA and DHA, providing with the optimum ratio of omega fatty acids. Want to know the best? A crucial ingredient, Bacillus coagulans, promotes balanced digestion and immune system, which is excellent for extra energetic hounds. K9 Natural Beef Feat is a combination of grass-fed, free-range beef and best fruits and vegetable cultivated in New Zealand. The food is packed with high-quality ingredients, and therefore, can be served to canines at any stage of life. This formula is in accordance with your pet natural digestive system, which makes it an excellent frozen raw dog food. The K9 nutrition is perfect for picky dogs, considering it doesn’t contain additives or artificial preservatives. It’s gluten-free, rice-free, wheat-free, and corn-free. In summary, the K9 Natural Beef Feast recipe is appropriate for any breed of dog. It will meet his nutritious needs, and help him lead a long and healthy life. Some dogs only rely on meat in their diet. They don’t want grains, gluten, or fillers, just real, fresh meat. If you are dealing with such a pet, then Vital Essential, limited ingredient formula will be a perfect match for him. The recipe contains gluten-free dehydrated beef meat. You can serve it as a balanced meal, a nutritious treat, or mix it with kibble. Considering it features a single protein, it’s a good match for canines with food sensitivities and allergies. The bottom line: with Vital Essential nutrition you will offer your pet a high-quality diet and best features a raw pet food can have. Stewart Raw Naturals combines only the finest freeze-dried nutrients, to retain natural aromas, flavors, and nutritional value. A single protein source will keep your canine healthy and sated. The formula is enriched with real fruits and vegetables which offers your pet a balance and variety in one single meal. The presence of antioxidants enables your pooch to maintain a healthy weight and have a controlled diet. This gluten-free and grain-free recipe provides optimal levels of essential fatty acids, vitamins, minerals, and enzymes. It promotes your pet’s health and well-being. In the end, the Stewart Raw Naturals is one of few raw dog food companies that payс attention to canine’s nutritional needs. So, make sure to try it next time! Bravo beef recipe is a natural diet featuring crucial vitamins and minerals. 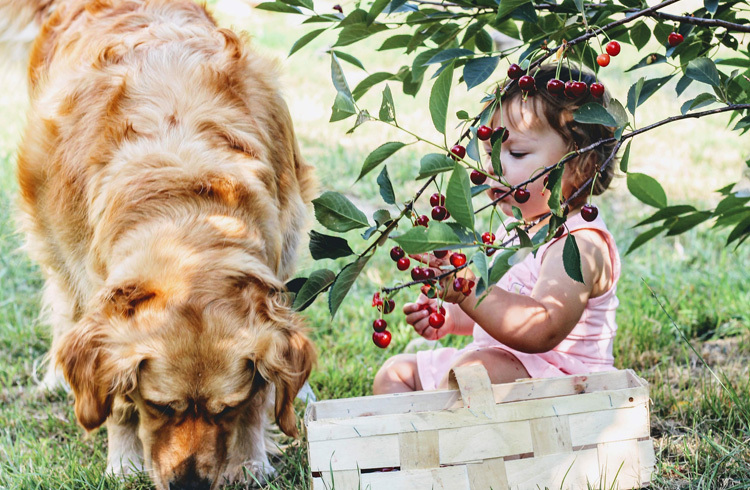 The combination of vegetables and cranberries offers your pooch balanced nutrition. It doesn’t contain artificial colors, preservatives, or cheap filler. With a bit of water, you can have a nourishing meal in a matter of minutes. This meal incorporates carefully-picked components, which are essential for a dog’s diet. In all, Bravo beef formula is an excellent selection for canines which demand additional supplementation. Therefore, their feeding-related requirements will be satisfied. Tylee’s Beef Recipe allows you to experience all the benefits of a homemade meal for your pooch. Considering it contains human-grade ingredients, like the ones you’ll find in a grocery store, it means their product goes through a rigorously regulated manufacturing process. It’s a grain-free formula, containing one protein source, which is valuable for dogs with food sensitivities. Tylee’s Beef Recipe features real fruits and vegetable. They are packed with antioxidants, fibers, vitamins, and minerals. To conclude, we have to admit that Tylee’s offers a different approach to dog nourishment and it can be а perfect option for canines with specialized needs. When it comes to unprocessed dog food, components play a crucial role. The meals should be complete and balanced, providing the right amount of nutrients, vitamins, and minerals. The best meals feature a single sourced animal protein as its 1st ingredient. And, they all should comply with AFFCO and NCR regulations. Another thing to consider when purchasing raw nutrition is a brand or company you choose to trust. However, considering the number of brands, it’s quite challenging to find the right one. Preferably, you should pick a manufacturer in the country you reside or, the company that has a high number of positive reviews. Dehydrated meat should go through a highly-monitored and vigorous process of preparation. However, customers don’t have insight into the company’s manufacturing rules. But, it essential to know where the meat is coming from. That’s why it’s crucial to purchase formula from a highly trusted source. Otherwise, you will compromise your pet’s well-being. A well-balanced raw diet isn’t always an affordable one, especially if you are using innovative protein source. On the other hand, if the price seems too good to be true, then it probably is. Make sure to compare the prices before you make a purchase. The nutritional analysis should help you as well. Meal rich in fats should indicated the low price. Unprocessed food for canines is designed to simulate the nutrition of your dog’s early ancestors. A couple of main ingredients found in this type of diet are meat, bones, and vegetables. They require minimal processing and should meet all the dietary requirements of your pet. However, as we mentioned before, pet owners need to be extra careful when purchasing minimally-processed dog recipes. Considering meat doesn’t have a long shelf life, it’s prone to bacteria and other contaminants. If not processed fittingly, it can get spoiled in a matter of hours. Have you ever noticed how wild dogs and wolves have beautiful and shiny fur? Well, it all comes to diet. Thanks to a raw diet, around 40% of the protein your pet eats goes into his skin and coat. There is no need to add an extra oil fish, or a ton of supplements, let nature take care of it. Say goodbye to gasses and digestive issues. Overall, gastrointestinal functions will be improved, and your dog will never feel digestive discomfort. With dehydrated dog food, you will eliminate upset stomach disorder with canines and help your pet keep his health in balance. Canines which consume unprocessed food are in better physical shape. None of them seems to be struggling with weight management and obesity. Just ripping and chewing meat is an exercise itself. With this type of diet, there is no additives and preservatives, which can damage your pet’s health. Do you know that wheat and corn are primary food allergens? By eliminating these two ingredients, you will avoid allergies with canines. If your pet is prone to allergies, or food sensitivities, then switching to best organic raw dog food, will help you solve this issue. Plus, it’s cheaper than a vet’s treatment. Are you tired of cleaning the mess all the time? How would you like for your four-legged friend to have a firmer stool? Well, it can happen, if you use fitting nutrition. You can also try the one from our list of top rated food for dogs with diarrhea. Natural ingredients and unprocessed diet will help you kiss this problem goodbye. Raw meat contains various bacteria and parasites. The most frequent one are salmonella, e-Coli, and listeria. However, they don’t pose a threat to canines only, but to owners as well. The risk of contagion is a massive health concern; that’s why unprocessed food should comply with all safety standards. People who live in small apartments have less space for freezers and refrigerators. The majority of raw food requires a cold environment, which is a commodity many pet parent can’t afford. On the other hand, if you have a basement with two chest freezers, then this might not be a problem after all. With freeze-dried raw dog nutrition, canines can explore a variety of tastes. Dogs are quite fond of it and enjoy eating this type of food. Additionally, it’s not messy, and it doesn’t get all over the area where you feed your pet. In most cases, freeze-dried nutrition doesn’t contain cornmeal or byproducts. This formula features only high-quality components, such as beef, chicken, lamb, organ meat, vegetables, and fruits. These ingredients are formulated to provide optimal nutrition. They are high in protein and low in carbs, and it’s just what you need to stimulate lean muscles in your pet, and overall health. One of the crucial benefits of a freeze-dried raw diet is the stable shelf life. It can be utilized in the same way as kibble. However, there is no mess or handling raw food to provide a balanced meal. Pet parents only have to measure a cup, feed their dog, and experience all nutritional perks. Dehydrated food combines only top-rated ingredients, including muscle meat, organs, and ground bones. Some of them are even enriched with freeze-dried fruits and vegetables. Commercial raw dog food for dogs features a couple of varieties. Depending on a primary protein source, you can choose between chicken, beef, and lamb. When it comes to components, the majority of minimally-processed food feature one protein course. It is often combined with fruits and vegetables for additional fiber implementation. This diet is packed with vitamins, minerals, omega fatty acids, and probiotics, which will promote digestion and healthy bones. Before switching to this type of diet, pet owners should consult their vet. However, one piece of evidence indicates that raw nutrition can improve canine’s health. Can you feed your dog raw meat? In essence, dogs are carnivores. They have the ability to digest unprocessed meat. The opinions are divided when it comes to this topic. It all depends on your canine and whether he enjoys eating this type of food. If you are ready to switch to raw diet, then you need to make sure that meat is contaminant-free. However, you have to be extra careful with suppliers and brands. To be sure that your furry companion is eating the finest ingredients, go for pet stores, regular stores, and butches. They all comply with the safety regulations, which means their food safe and protected. What should beginners know about raw feeding? Unprocessed food is designed for carnivore’s digestive system. Pet parents should start with muscles meat to help their dogs adjust to this type of diet. On the other and, if you notice some reaction, stop immediately, not all pooches can adapt to raw feeding. Is it recommended for cats too? The crucial thing is patience. This transition can be fast, or very slow, it all depends on your cat, and how well she accepts this type of diet. What are good recipes that I can make at home? There has been a lot of controversy about commercial raw dog food. Nowadays, pet owners can experience a variety of brands, formulas, and ingredients. However, we advise you to talk to your vet, before making a transition. For instance, if you choose a commercial diet, then you don’t have to worry about nutrient deficiency, which is a typical case with homemade meals. Even though it’s still new and disputable approach in the pet care industry, people who are feeding their canines this way, only have words of pray.